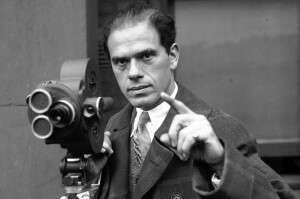 Born in Italy, Capra grew up in Los Angeles and directed his first films in the early 1920s. In 1934, his It Happened One Night won an Academy Award and typified his gently satiric, slyly sentimental comic style, which presented naïve heroes who embody optimistic American “populist” values—founded on essential selflessness and decency—that invariably enable them to triumph over shrewder, more cynical opponents. Favorite Capra films include Mr. Smith Goes to Washington (1939) and It’s a Wonderful Life (1946).